Tea Etiquette is very popular in certain cultures. Whether you take tea in Europe or in the South, there are different acceptable behaviors. Many make Tea Faux Pas every day. You might not even know it. 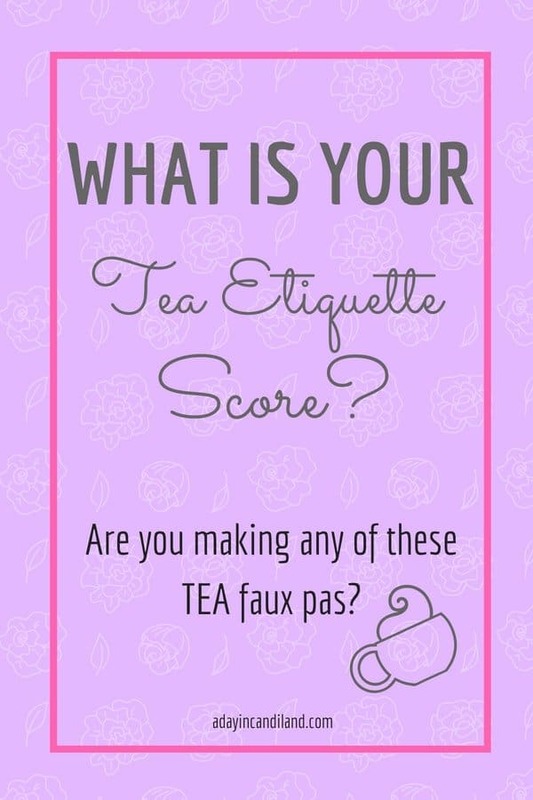 Today you are going to learn proper tea etiquette and Tea faux pas do’s and don’ts. You might find some answers in my other tea posts. 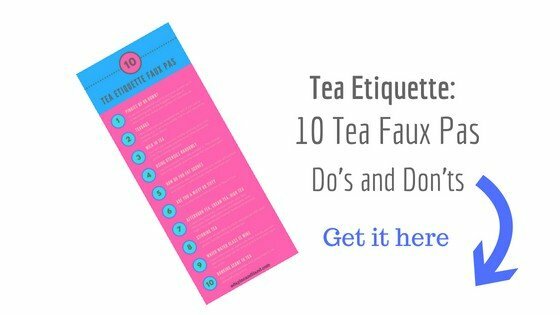 Make sure you get your 10 Tea Faux Pas Do’s and Don’ts below. Are you a Miffy or Tiffy? Next, add the sugar and then lemon. If you add the lemon first the citric acid will not allow the sugar to dissolve properly. What do you do with the teabag, assuming you are using bagged tea? This is not a proven faux pas either way. Also depending on who is serving you, they may ask you to add the milk first before they pour the hot tea. This will give you a warmer tea, than pouring the milk after. Is there a difference between a cream tea, afternoon tea or high tea? Does it really matter? Where does the small fork go, on the inside or outside of the larger fork? Why do I have two forks, is it there in case I drop one? Do the forks go on the right or the left of the plate? So here are a few questions we will answer in this post. 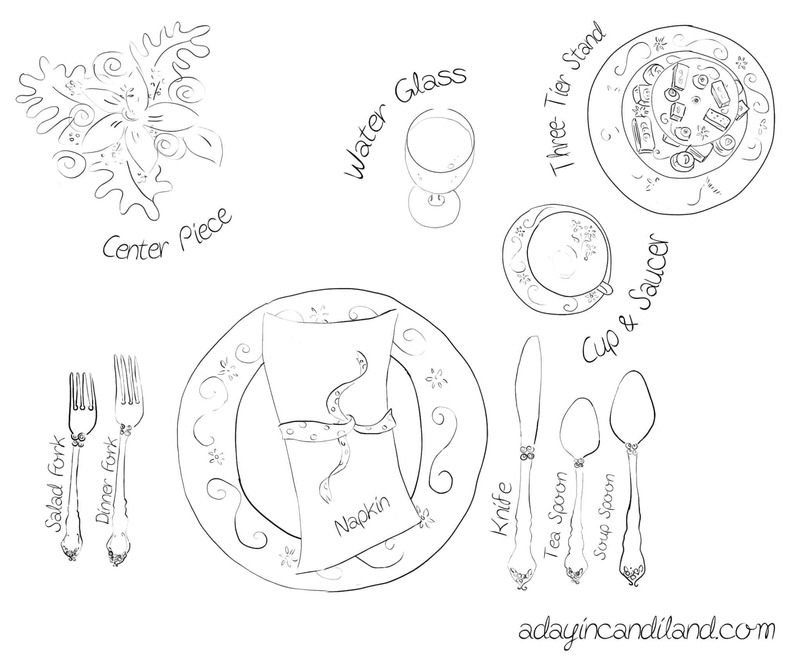 Below you will see a place setting on how to properly set the table. 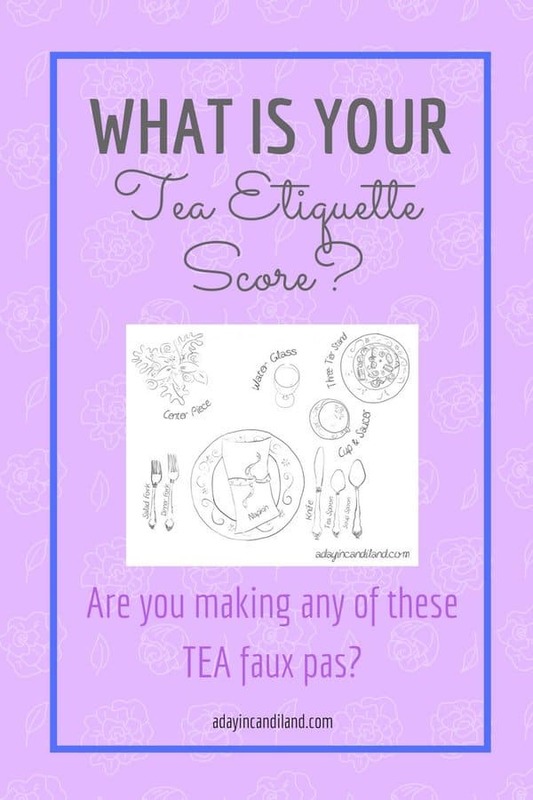 What is your Tea Etiquette score? It is custom to start with the outside fork and move in toward the plate. A Cream Tea is usually scones, clotted cream, and a choice of tea. Afternoon Tea consists of finger sandwiches, scones, sweets, and dessert, and a choice of tea. The finger sandwiches are also called savories. High Tea is a heavier meal, usually later in the evening. This meal usually contains some meat. Maybe a meat pie, or Welsh Rarebit, sausage, cheeses, relishes and has hot and cold items. Alcohol may also be served. See more Afternoon Tea items in my Tea Shop here. Which Water Glass and Bread Dish is Mine? How do I know which is my water glass and bread dish when I sit down at a set table. The rule goes make two ok signs with your fingers. The one on the left should look like a b. The one on the right should look like a d. Your bread dish is on the left and water glass (drink) is on the right. If you are using a tea bag, please don’t wrap it around a spoon with the string and squeeze it. A tea caddy should be used with bagged tea. You can place it on the caddy and it will catch the excess liquid. So how did you do? Did you score between 1-10? Will you be added to the Tea Drinkers Hall of Shame? Information from this post came from one of my favorite books Tea & Etiquette from Dorothea Johnson. 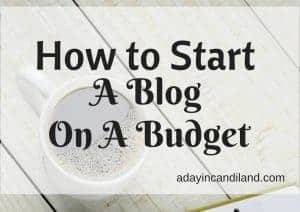 You can find some of my other tips about tea here. Join us to learn more about Tea and Encouragement on our Facebook Page. I am the tea drinkers Hall Of Shame Valedictorian. Just saying……. Oh no, well after you read all my tips, you will be an expert. "Tea" is a lot more complicated than people realize! 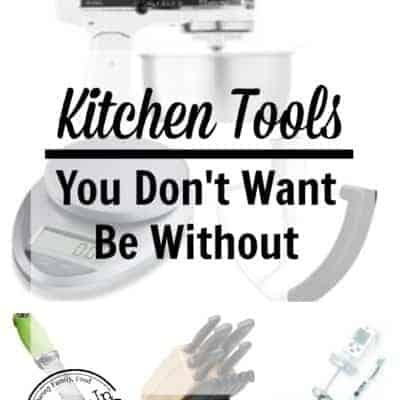 Thank you so much for sharing at this week's Super Saturday Afternoon Tea Link-Up!!! thanks for your response and thank you for hosting the link up. Wow!! I am pretty ignorant when it comes to tea etiquette. Its ok, its mostly just for fun. Unless you are at a formal teahouse. High Tea is very popular in Singapore and so I've attended a few at different hotels. Also, we have a friend who is Japanese who has taught us quite a bit about Japanese tea rituals. It is crazy how many different services exist! I love tea time! My aunt is totally into all of that, so I know more than I realized. Yay for me!!! I feel accomplished and would now like a gold star. Well, Candi, I didn't score very well! 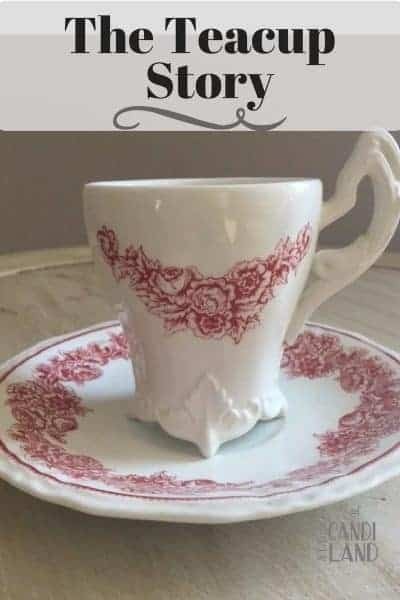 I'm surprised because I've had a couple of tea parties at my house in the past! Thanks for the "ed u ca tion"! Tootles! I don't think I know my tea etiquette so well. I do add sugar and milk in the right order. I loved learning the tip about lemon and sugar. While I don't usually add it to hot tea I need to remember this for my iced tea as I am guessing it is the same. I'm ashamed to say that my etiquette score is not very high. I knew some of the info but I learned alot more!